All you need to know about Anil Vij's 50 lac announcement, khel gaon in Dera Sacha Sauda, Sports Nurseries by Govt, statements of Vijay Goel and Saint Ram Rahim. On 27th August, Haryana Health and Sports minister Mr. Anij Vij visited Dera Sacha Sauda (Sirsa) to watch Tiranga Rumal Chhu League which was organized to promote traditional Indian games. This tournament had strict rules against drug consumption, athletes were not even allowed to smoke and regular drug test was done which resulted in banning of 5 players from the league. Anil Vij applauded the concept of fostering our Indian games to an international level, he congratulated Saint Ram Rahim for TRL. Saint Ram Rahim modified the rules of contemporary Rumal Chhu games by mixing it with games like kho-kho, kabbadi and wrestling, Anil Vij called this game a perfect "combo". Sports minister Anil Vij told the media that he visited Dera Sacha Sauda few months back to check sports facilities of the Institutions situated inside Dera. Students of these institutions have won hundreds of medal for the nation on international levels specially in Yoga and Inline Roller Skating Hockey. Anil Vij applauded the fact that no Dera athlete consumes any kind of drugs or steroids. He appreciated Saint Ram Rahim's efforts for the construction of Khel Gaon (Sports Village) in Sirsa and then evinced Government's new policies to create athletes for next Olympics by opening 20 sports nurseries in each district of Haryana and then he announced a fund of Rs 50 lakh to aide the sports nursery there from, that caused a stir in media. Thanks to the pseudo-intellectuals, that media portrayed this entire episode as if the funds were given for Dera's personal interests. Pity on them who believed in those half baked story, because..
TRL was sponsored by MSG All Trading Pvt. Ltd. which has a huge market in north India and having no shortage of money, they sponsored the event wholly. Not just this they were giving Okinawa electric bikes worth rupees 43000 in every match to the man of the match and car to the man of the tournament; grand prize of 50lakh was given to the winning team and 30 lakh to the runner-up team. Still opposition teamed up with media and claimed that Dera Sacha Sauda organized TRL from the fund given by Vij, which has not been released yet. Not just this, more laughable is, a leading (call mis-leading) national channel called a debate on its primetime show, and claimed Rumal Chhu is Baba's game and Vij has allotted the fund to promote it. What kind of Indian you are, if you do not even know about traditional Indian games? I played this game in my childhood and so did my father in his, this is not Baba's game. And the fact is irrefutable, that Vij didn't allot this fund for promoting Rumal Chhu but the athletes who belong to underprivileged sections of society and are getting free coaching in Dera's institute. Wake up media, you cannot shade the sun for long. Dera Sacha Sauda is the world's largest humanitarian organization having about 6 crore volunteers and are famous for their humanitarian works. You'll be surprised to know that Dera Sacha Sauda doesn't accept any form of donation, there is not even a single "Daan Paatr" (donation box) in any Dera of this organization, volunteers use their own money in humanitarian works. If Dera Sacha Sauda needed money they could have simply installed a donation box to collect billions in no time, 50 lakhs? Doesn't even matter. Still a senior spokesman from the opposition said that Anil Vij gave the money to Dera, that is far beyond from logic. Clearing the air on ongoing rumors, Saint Ram Rahim clarified things on the very next day during the final event of TRL in presence of central Sports Minister Vijay Goel. He told media that no money has been given to Dera Sacha Sauda or Tiranga Rumal Chhu Game, money was announced by Anil Vij for sports nurseries that will be made by Government in Khel Gaon for the benefit of players of schools and colleges of Sirsa. Dr. Gurmeet Ram Rahim also said that whole country should be proud and happy about the steps that PM Modi and government is taking to prepare athletes for next Olympics instead of fighting or playing politics over it. Vijay Goel also backed Anil Vij saying the center government will also support the players who come from underprivileged sections of society. He said that the money was for the sports nurseries that will be made in Khel Gaon aka Sports Village, Sirsa. Money is for sports, for Indian sports. I can give only Rs 50 lakh under the rules. Otherwise I would have given more. Central Sports Minister Vijay Goel supported Anil Vij and said that central government will also try to help young village athletes of sports nursery to prepare for next Olympics. They will try to make the dream of PM Narendra Modi's next Olympics true. 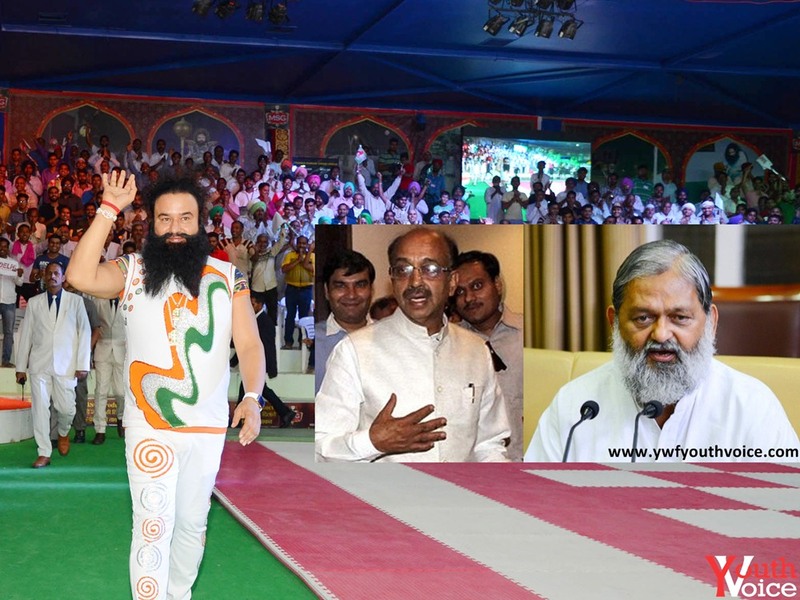 The Centre will support Dera Sacha Sauda in setting up sports village in Haryana. Despite of these clear statements from Anil Vij, Vijay Goel and Saint Ram Rahim, opposition is trying its best to somehow misguide the people by taking help of media. This is the media which criticizes Olympians and Sports Ministry for not winning medals and is now criticizing the efforts of Sports Ministry for God knows what reasons, this time it looks more than for "TRP". On estimating the amount money that Dera Volunteers will contribute to make Khel Gaon, 50 lac sounds a very small amount still opposition is trying to make a big deal out of it. We wish Anil Vij all the best to deal with these kinds of cheap oppositions and media and we are quite sure that he can handle them quite well. May Khel Gaon produce the athletes that our country needs to bring Olympic Golds to the nation. Let us know in the comment section what you think about this act of opposition, efforts of Anil Vij and Khel Gaon.